Star Citizen is one of the most eagerly awaited PC games of all time, and with good reason: Christ Roberts is behind it, the legendary video game designer who gave us the likes of Wing Commander and Strike Commander back in the 90’s. And with Star Citizen Roberts has promised a persistent online universe with countless worlds to explore, missions to take on and plenty of space dogfighting to engage in, as well as first-person combat in the game’s sci-fi world. Because in a way Star Citizen could be the most ambitious multiplayer game ever made, while also boasting a single player campaign featuring talent like Gillian Anderson and Star Wars’ Mark Hamill. At least this is what was promised when the game’s crowdfunding campaign got under way back in 2012, a crowdfunding effort that has since surpassed the $100 million mark, making Star Citizen the most successful crowdfunded video game of all time. And this is a project that appears to be coming along nicely despite the criticism it has received in the past, and despite the fact that some fans were distraught when it was recently announced that Squadron 42 (the game’s single player campaign) would be delayed out of 2016 according to gaming website GameSpot. Star Citizen could yet delight fans of Chris Roberts’ 90’s era games like Wing Commander though, as it not only appears to have some pretty good gameplay judging by recent footage seen at Gamescom 2016, but is also likely to boast some of the best visuals ever seen in a PC game to date. After all, games like Wing Commander and Strike Commander were some of the most visually stunning at the time, and it looks like designer Christ Roberts will be looking to push the technical envelope with Star Citizen too. Actually, a trailer released for the game in December last year showed an example of the game’s procedurally-generated planets, which feature an incredible level of detail and are some of the most realistic-looking this side of Bioware’s Mass Effect games. And while other games like No Man’s Sky also promised a plethora of detailed planets to explore, it seems Star Citizen might actually deliver in this regard, unlike Hello Games’ disappointing effort. Star Citizen also looks like it will feature some very detailed character models and building interiors as was seen in the game’s demo at Gamescom 2016, and also some sumptuous-looking spaceships, plenty of which can already be bought on the game’s official website. 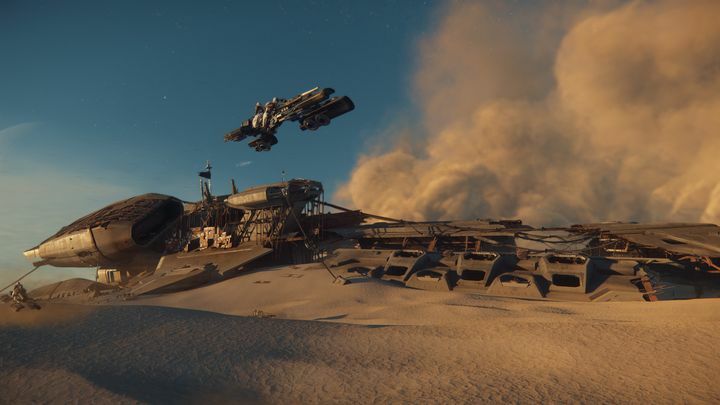 Of course, while it is clear that the technology powering Star Citizen and its single player campaign Squadron 42 is no doubt impressive, this does not guarantee the game will feature great gameplay or that its persistent online universe will be a fun and enjoyable place to while away the hours in, while other games like this year’s No Man’s Sky also tried a similar gameplay formula and failed at it. But here’s hoping that Chris Roberts and his company Roberts Space Industries can deliver on their promises, and that players will get to play another great game in the vein of his earlier classics like Wing Commander when Star Citizen finally sees the light of day.